Hillsboro’s Callan Meyers receives a pass from midfield as Lady Panthers defender Reagan Barton gives chase on Thursday at Hillsboro High School. Meyers had the lone goal for the Lady Indians in the match. 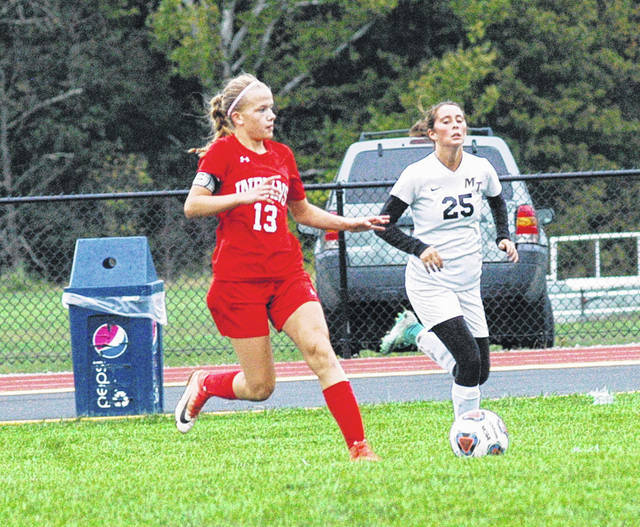 HILLSBORO – The Lady Indians hosted the Lady Panthers of Miami Trace on Thursday in Frontier Athletic Conference soccer action and earned a tie to even the season series at 1-1. The field conditions were unfavorable and it was evident in the first half as both teams struggled to find a rhythm on the sodden pitch which left the game scoreless at halftime. “We knew it was going to be a tough game coming in. The muddy field made it interesting, you know, slipping and sliding all around,” said Lady Panthers Head Coach Caitlin Francis. The Lady Indians were the first to strike in the second half as Callan Meyers sent one past the Miami Trace keeper less than two minutes into the half for a 1-0 Hillsboro lead. Becca Ratliff had the lone goal for the Lady Panthers as she responded with 31:33 to play in the match to tie it at 1-1. It was a stalemate from that point on as neither team was able to gain an advantage over the other and the horn sounded with the score knotted 1-1. “Last time that we played then they beat us four or five to one. We weren’t playing as a team, we couldn’t solve the riddle there. What we have been progressing to the entire season is solving everyone’s riddle because a lot of them play the same formation. Towards the end of the second half we turned on the pressure and were actually playing the way to beat everyone else,” said Hillsboro Head Coach Anthony Carson. Both teams will be back on the pitch Tuesday, October 2, when Hillsboro travels to Chillicothe and Miami Trace goes on the road to Jackson for FAC matches. https://www.timesgazette.com/wp-content/uploads/sites/33/2018/09/web1_Hillsboro-Girls-Soccer.jpgHillsboro’s Callan Meyers receives a pass from midfield as Lady Panthers defender Reagan Barton gives chase on Thursday at Hillsboro High School. Meyers had the lone goal for the Lady Indians in the match.